S M Ong: Unfounded Alice Fong conspiracy theory: Is Jem covering up something? Unfounded Alice Fong conspiracy theory: Is Jem covering up something? This month is the first anniversary of probably the worst thing that can happen to you when you’re dining at Jem. 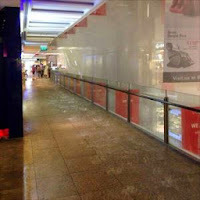 On June 4 last year, at the Din Tai Fung restaurant in the Jurong East shopping mall, a ceiling pipe burst, pouring what was euphemistically reported as “waste water” on a couple of diners. “It stunk like faeces,” said a witness. Then the unbridled rage she displayed in the recent viral video would have been justified or at least understandable. Ms Fong was also dining at Jem on June 3, almost exactly a year after the “faeces” incident. But she was in the foodcourt, not Din Tai Fung. And she wasn’t drenched in waste water, although she did say she found something dirty in her food. What was this mysterious “dirty” thing? What if it were something from, say, a defective ceiling pipe perhaps? Then it was Ms Fong’s duty to take a picture of this “dirty” thing and report it to someone in charge so that a thorough investigation could be conducted and a recurrence of what happened at Din Tai Fung a year earlier could be prevented. Ms Fong could be like the hero sheriff in Jaws and Jaws 2 (“Just when you thought it was safe to go back to Jem”), trying to warn everyone about the impending disaster, but no one would listen to her until it’s too late and you’re already eaten by a shark or drenched in faecal-smelling sewage. But as Ms Fong was planning to take the photo, a cleaner tried to take away her food. 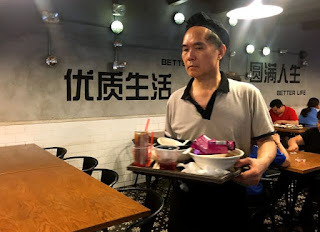 Ms Fong later found out that the cleaner might not have heard her stopping him from clearing her food because he is deaf. And the rest is viral history. Just another case of someone caught behaving badly on video. Or could it be an elaborate conspiracy cooked up by Jem to cover up its plumbing problems? Jem is of course infamous for a series of unfortunate events (fires, false ceiling collapse) since the mall’s official opening was delayed in 2013 because the fire permits weren’t ready. Plus this month also happens to be the second anniversary of another incident at Jem where water came pouring from above. The “too long, didn’t read” version: It rained inside the mall. At least no witness said it stunk like faeces. So is it possible that on that fateful day Ms Fong spotted something dirty in her food, a spy planted by Jem inside the foodcourt also spotted Ms Fong spotting something dirty in her food? To prevent her from taking pictures of the evidence, the spy quickly directed the foodcourt manager to dispatch a cleaner to commandeer her food. And when Ms Fong complained to the manager about the cleaner, the manager would tell her that the cleaner is deaf, thus provoking her to go on a politically-incorrect tirade about the disabled. All this was to guarantee that once the video was uploaded online, it would go viral and and turn Ms Fong into the worst human being to come along since Ms Amy Cheong, Mr Anton Casey and that former Miss Singapore finalist who made a joke about a man’s “holey” shirt on the MRT. And while everyone is busy vilifying Ms Fong (who has since admitted she was in the wrong) or decrying the mistreatment of people with special needs, no one is paying any attention to the “dirty” thing Ms Fong found in her food in the Jem foodcourt. Next time you spot something dirty in your food, be quicker with your camera.